This is a four-color shocker and if the holiday gift-giving season is not entirely over, a fine present to a youngster. The facts are hardly unknown—a recent Guardian report, based on British intelligence records, reconfirmed the CIA role in overthrowing the elected and beloved Iranian leader—or even untreated in previous comic art. (Reviewer disclosure: the coverage of the same coup, in A People’s History of American Empire, aka the Howard Zinn adaptation, is brief but excellent.) Rather, because of the current state of the Middle East: the US/British intelligence operation more than a half-century old remains, like the more recent US invasion of Iraq, remains so much at the center of the disorder in the region today. And also because this book is professional-looking in the mainstream “noir” comic style a la Alan Moore that runs second to superhero comics and far above most nonfiction works. Success may bring more projects like this closer to the local comic-book-store addict of various ages, mostly male and mostly seeking “action” as well as story and drawing styles. We hope so. Some time ago, President Barack Obama actually came close to apologizing or at least admitting that a wrong had been done to the Iranian people–but without specifically pointing to the perpetrators. (Potential candidate Hillary Clinton has, for her part, offered not a single apology.) Democratically elected Iranian president Mohammed Mossadegh, seeking to chart an independent course between the Superpowers, as Marshal Tito had already managed in Yugoslavia, ruled over a sea of oil that the US and Britain had planned to exploit. In ways that most careful readers of diplomatic, military and intelligence history now find familiar and even obvious, with help from the Snowden revelations, the furious plotting, carefully planned and funded uprising met with splendid imperial success in 1953. The Shah, once installed, ruled as a bone-crushing potentate for a quarter century, largely thanks in no small part to Shavak one of the most feared and brutal intelligence agencies in the world, widely rumored to have been heavily infiltrated not only by the CIA but also by Mossad, its Israeli variant. Let us not be deterred, however, by these details. 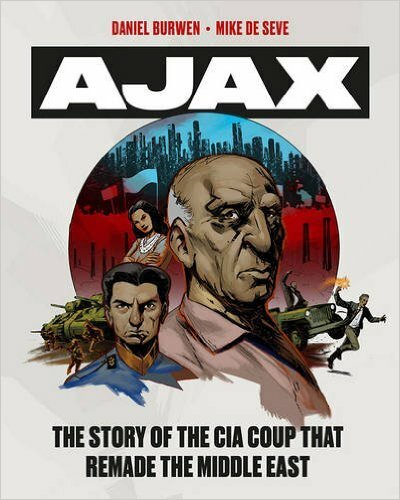 Operation Ajax is quite a fine book in its own respect. The narrative is sharp and unrelenting, the art equal to the task of presenting a dark (or fallen) world where greed of the powerful is the one constant, and thus we advance across the first half of the twentieth century step by grim step. The Old Empire (not, actually, quite so old in this part of the world) of European might and purported romantic adventure came to a new point, early in the century, with the discovery of oil and the growing reliance of the British economy and empire at large upon control of that oil. The measured collapse of the royal regime gave a veteran Iranian politician his chance. Mohammed Mossadegh was already past sixty in 1941, no radical, but pushed forward by the direct action of the oil workers, as badly treated as they were necessary for extraction of “black gold.” Mossadegh had one more crucial if untrustworthy ally: the Ayatollah of that time. Together, the two schemed at something downright unholy, a favorable split of oil revenues with the British, en route to outright nationalization. Riots and near uprisings gripped the country in the nationalist wave moving through the region. There’s an exceptionally odd narrative moment here, as a thoughtful Harry Truman ponders helping the Shah, and then some pages later, embraces Mossadegh as leverage against the British. Thus, an opening for the US. Truman frets, the UN discusses the issues, the Shah takes cover in the US and Winston Churchill, in the twilight of his career, reassures himself that action speaks and the Iranians would cave in to a British show of force. This is high drama, and comics action at its best. And yet there is a strangeness: the 1952 American elections bring in Eisenhower, with him the Dulles Brothers at the center of both the CIA and State Department, and a national political climate described as “Fear” (the title of Chapter 6). We see Cold War propaganda accelerating along with CIA sneakiness. But wait a minute. The allegedly liberal wing of the CIA had conspired with historian Arthur Schlesinger, Jr., several years earlier to create covert funding for intellectuals and artists who would take the State Department line to the world, and enjoy large personal benefits in return, prestige and publishing contracts to luxury global junkets. The revelations by Ramparts magazine in 1967 proved so embarrassing that Isaiah Berlin pleaded with fellow schemers not to write tell-all memoirs. The Dulles Brothers certainly added something, but the CIA operation was well underway, and liberals as well as conservatives had their hands dirty up to their armpits. Ignore this reviewer’s complaints and find the book for yourself and other potential readers. Paul Buhle is the authorized biographer of C.L.R. James and editor or coeditor of two other volumes on James’s life and work. The biographical C.L.R. James Comic, drawn by Milton Knight and edited by Paul Buhle, will be published by Alternative Comics in 2016.